Convert popular spring units such as force or retaining ring thrust capacities into metric units with Smalley's engineering tools. Simple tools allow for units to be converted such as mass and weight, angular measurements, velocities, temperatures, pressures, and more. Other tools allow engineers to design custom springs and retaining rings. Click here for the Conversion Tool. The Power Infuser®, manufactured by ZOLL Medical Corporation, is used to treat wounded soldiers in the battlefield who require rapid, controlled replacement of intravascular volume. The pump can deliver IV fluids or blood at rates as high as 100mL/min or a single fluid bolus of 250mL in 2.5 minutes. Read more about this exciting DC gearmotors application. A test stand builder collaborates with Siemens Industry on variable speed drives and motors to affect green, lean solutions for testing helicopter powertrains at a Department of Defense customer. Originally, the company had 20 test stands. That number has been reduced to five. 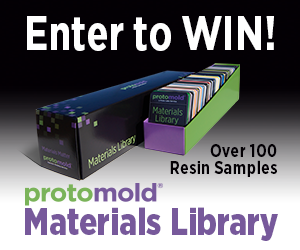 Twenty winners will be selected at random to receive this boxed set of over 100 thermoplastic resin samples from Protomold. Be the envy of your engineering department. Ends 2/28. Enter now. Raimondo Berger, a German designer, manufacturing expert, and lover of sport motorcycles, designs and builds forward controls, triple trees, and other precision parts for sport motorcycles of various brands. SpaceClaim Engineer software gives him a 3D tool to rapidly give shape to ideas and develop them to the production stage with minimal inconvenience. With SpaceClaim as his tool, Berger is daring even to reconstruct the legendary Honda CB 900 Bol d'Or Super Sport from 1979. The United States Automotive Materials Partnership LLC (USAMP) recently completed the second phase of its Magnesium Front-End Research and Development (MFERD) Project, resulting in a significant reduction in weight and parts. The project is part of a worldwide automotive research effort. 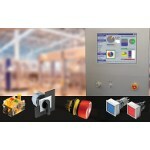 Create the human machine interface (HMI) of your dreams with user-friendly, ergonomic, and highly functional control and visualization systems from EAO Corp. EAO products are widely used throughout the machinery sector in food and beverage production, packaging and labeling systems, and assembly and automation, among many others. From high-complexity visualization terminals with touchscreen and pushbutton controls, to handheld machinery pendant controls and simple on/off panels, EAO can build virtually any type of interface. Using Design for Manufacture and Assembly (DFMA) software, engineers at International Game Technology (IGT) in Reno, NV, radically redesigned the internal components and configuration of the G20 series slot machine. The result? Assembly time was reduced 50 percent, part count went from about 800 down to 500, and a significant cost reduction was achieved. So if you haven't heard of the Raspberry Pi single-board computing craze, well, it's never too late to jump into something really great. Eben Upton and his colleagues at the University of Cambridge's Computer Laboratory have come up with a $35 credit card-size Linux computer with 512 MB RAM "that plugs into your TV and a keyboard. It's a capable little PC that can be used for many of the things that your desktop PC does, like spreadsheets, word-processing and games. It also plays high-definition video." It is also incredibly flexible, design-wise, so makers and professional engineers alike can get really creative with little investment. A power supply or SD cards are not included, but they can be purchased at the same time in bundled packages. You can order one from Newark (link below). Check out raspberrypie.org and then get to Googling projects. I think you'll be pleasantly surprised. Fixtureworks will be showing Fairlane Products' urethane-covered bearing, cam follower covers, and press-fit rollers at the 2013 PAC Show Feb. 12-14 in Anaheim, CA. Urethane-covered bearings have a smooth surface that is cast directly to a precision sealed ball bearing, providing a smooth, quiet, and non-marring operation. 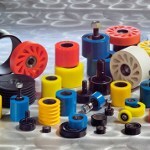 Cam follower covers have a smooth urethane outer surface that is permanently bonded to a steel insert. They are designed to be press fit onto standard cam followers to prevent metal-to-metal contact and damage to finished or delicate surfaces. Press-fit rollers have a smooth surface, permanently bonded to a steel insert that allows for customizing the mounting configuration. Haydon Kerk Motion Solutions, a brand of AMETEK Precision Motion Control, has introduced the latest and final addition to the new BGS (Ball Guide Screw) linear rail product line. 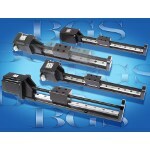 The BGS06 linear rail is a versatile system utilizing the popular size 17 single-stack or double-stack stepper motor linear actuator. Depending on static, dynamic, and moment load requirements, the product design engineer can now choose between 3 BGS frame sizes: the BGS04, BGS06, and BGS08. All BGS frame sizes are designed to position heavy loads and maintain repeatability and accuracy while withstanding significant cantilevered loading. Lenovo unveiled its multitouch, multi-user IdeaCentre Horizon Table PC at the CES show in Las Vegas Sunday. What's so huge about that? Well, the tablet size, for one: 27 inches of Windows 8 high-performance desktop computing that would sit nicely on your coffee table serving as game-play or design central (at 17 lb, you have to put it down somewhere). For those who are nonplussed with the size, the company is also working on a 39-inch widescreen version. Can't wait to see the carrying case for that one. If you missed Part 2 of our year-end most-popular stories roundup, check your inbox or you can view it here. Go to the Best Of Stories 2012 Part 2 issue. If you missed Part 1 of our year-end most-popular stories roundup, check your inbox or you can view it here. Go to the Best Of Stories 2012 Part 1 issue. New Scale's latest micro-positioning system fits eight axes of motion into an 80-mm space and runs on 3.3 V. Drive electronics are integrated right into the module; there's no external control board. 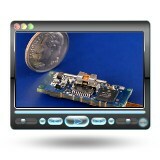 It accepts high-level motion commands directly from your system processor over an I2C interface. This implementation solves an optical alignment problem in a new and highly miniaturized instrument. New Scale applies the same design skills and micro-mechatronic expertise to just about any positioning application that requires small, precise, and smart motion. Analyst Flight School is brought to you by the Mobius Institute, leaders in vibration analysis training and ISO category I-IV certification. Using Mobius' Crystal Clear training technology, topics are delivered through extensive 3D animations and visual simulations that make complex concepts more understandable. Lessons are given as a series of case histories presented to the group. The group is split into teams; their goal is to solve the vibration problem in the least amount of time and least cost as they compete with other teams. The information is presented in an extremely real-world context. Walk into AFS-1 a novice and walk out qualified as "flight ready." This three-day course will be held Jan. 22-25 in Annapolis, MD. CE units provided to all participants. Recommended for CAT I or CAT II level analysts. Go to the www.mobiusinstitute.com after you check out the video.